Adam entered the international cricketing scene as a wicket keeper/batsman with the Australian One Day International side against South Africa in 1996. In 1998, Steve Waugh elevated Adam to the pivotal position of opening batsman in the One Day team. In only his second game as opener Adam scored 100 against South Africa and from then on almost singlehandedly redefined the role of the opening batsman in One Day Internationals. Adam made many crucial contributions in each of the team’s winning performances in 1999, 2003 and 2007 World Cups. In May 2007, Adam scored a history making 149 in the World Cup Final against Sri Lanka in Barbados to help secure Australia’s third consecutive World Cup. Adam has taken a world record 472 dismissals in One Day Internationals and scored over 9,600 runs at a phenomenal strike rate of almost 97 runs per 100 balls faced. In November 1999, Adam replaced Ian Healy as wicketkeeper in the Australian test side in Brisbane against Pakistan. Adam subsequently took a mammoth 416 dismissals in his 96 test matches for Australia scoring 5570 runs, including 17 test centuries, at an incredible strike rate of 82 runs per 100 balls faced at a career average of just under 50. In the deciding Ashes Test in Perth in December 2006, Adam scored the fastest ever Ashes century in 130 years and the second fastest test century of all time achieving the feat in only 57 deliveries. Later that year against Sri Lanka, he became the first player in the history of test cricket to hit 100 test sixes. Adam also reached the 100, 200 and 300 dismissal milestones faster than any other wicket keeper in test history. Adam is the only wicketkeeper in Australia to have captained the Australian Test and One Day International teams and is acknowledged for his leadership and outstanding contribution to the Australian team in both forms of the game. Adam led the Australian team to a 2-1 victory over India in that country in 2004. This was after Adam stood in as captain for Ricky Ponting who had been injured in the Champions Trophy in England just before the Indian tour started. It was Australia’s first series in India for 35 years. Many critics believe that Adam is the greatest wicketkeeper/batsman to have played the game. But more than his statistics it is the manner and spirit in which Adam played the game that made him one of the world’s most exciting and popular cricketer. In 2004 Adam was selected in Richie Benaud’s All Time Greatest Team. He joined Sir Donald Bradman, Dennis Lillee and Shane Warne who were also chosen in this illustrious team. On Australia Day 2008 Adam announced his retirement from all forms of international cricket, after breaking the world record for the most number of dismissals by a keeper in test match cricket at Adelaide Oval with his 415th test dismissal in the final match of the 2007-08 Border.Gavaskar Trophy Series against India. In May 2009 he captained the Deccan Chargers to victory in the 2009 Indian Premier League. He was also named player of the tournament. 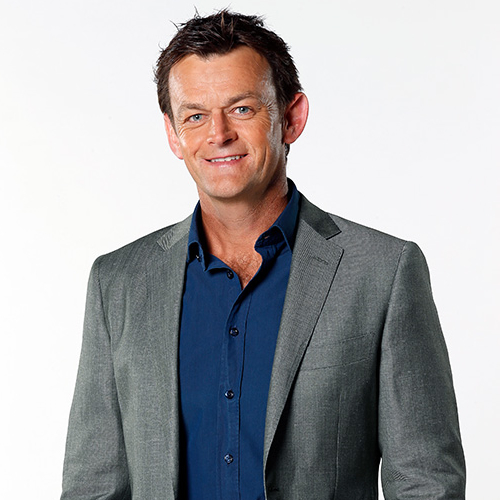 In 2010 Adam was awarded an AM for his contribution to cricket in Australia and for his services to the community through his involvement with various charities. He was Chairman of the National Australia Day Council for several years. Since his retirement from cricket he has carved out a new career as a TV cricket commentator. Much loved by audiences for his sporting achievements Adam is also an entertaining and inspiring speaker whose presentations provide a fascinating insight into the world of professional cricket, working together as a team, setting goals/leadership, and is peppered with anecdotes from his career which inspire audiences everywhere to strive for greater accomplishments. Adam’s warm and down-to-earth style is always a winner. R.Whiteman, State Director, Ray White Real Estate Group. J.Blakey, Curtis, Jones & Brown Advertising, Sydney. T.O’Neil, Executive Officer, Bunbury Golf Club Inc.